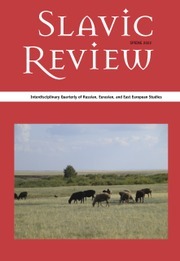 Slavic Review is an international interdisciplinary journal devoted to the study of eastern Europe, Russia, the Caucasus, and Central Asia, past and present. The journal publishes articles of original and significant research and interpretation, reviews of scholarly books and films, and topical review essays and discussion forums. Submissions from all disciplines and perspectives are welcomed. A primary purpose of the journal is to encourage dialogue among different scholarly approaches. Published since 1941, Slavic Review is the membership journal of the Association for Slavic, East European, and Eurasian Studies (ASEEES, formerly AAASS). Articles are peer-reviewed and editorial policy is guided by an international editorial board. Established in 1948, the Association for Slavic, East European, and Eurasian Studies (ASEEES) is a leading international scholarly society dedicated to the advancement of knowledge about Russia, the Caucasus, Central Asia, and East-Central Europe in regional and global contexts. The March issue of NewsNet has four articles that explore film, digital humanities projects, and the work of 2018 Vucinich Prize winner Natalia Roudakova. The Winter 2018 issue of Slavic Review is now available.